The winter is hard to capture sometimes. The light is elusive and the snow plays tricks on you. Never the less I tried it here. I used some existing art as a reference and took some roadside photographs as well. For this drawing I sketched out the primary landscape then the details. I used a charcoal pencil, then pastel. 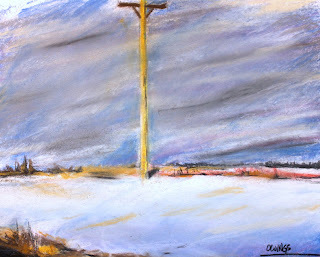 I also used a paint brush to wet work the pastel in various places. Prismacolor Nupastel is a nice basic medium that you can use dry or wet. I'll try this again sometime and keep the dark lines out.